April is Child Abuse Prevention Month. For my office, the Diocese of Camden’s Office of Child and Youth Protection, every day of every month is dedicated to preventing the abuse of our children. But during the month of April, time is set aside to look at this specific issue and what we can do to prevent harm of the children entrusted into our care. While “stranger danger” was for decades the well-worn phrase for keeping our children safe, what we know all too well now is that the dangers of abuse often come from those that our children have already met. According to the National Children’s Advocacy Center, one in 10 children will be sexually abused before the age of 18. Ninety percent of these children are abused by a family member or by someone they know and trust. While we must still teach our children to be careful around strangers, it is people known to them that are most likely to abuse them. Sadly, national studies suggest that 60 percent of children who are sexually abused never tell anyone. One of the main reasons for this is that the child not only feels as if the abuse is his/her fault, but he/she feels as if no one will believe him or her. And abuse is not limited to the tangible world, one in five children is solicited sexually while on the internet, where the damage is just as traumatic and long-lasting. 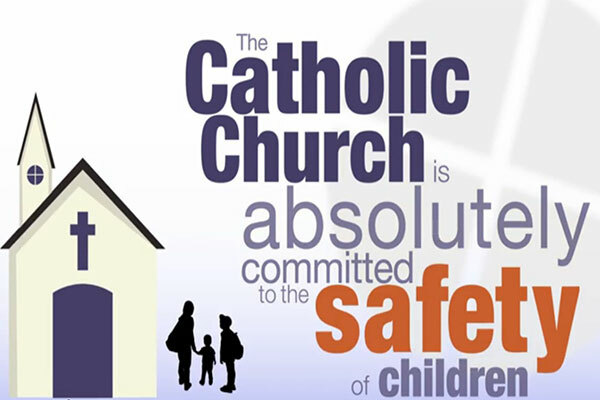 The Roman Catholic Church in the United States is committed to protecting children and to make the church the safest institution for our children. The United States Conference of Catholic Bishops (USCCB) has produced a brief video defining its efforts in this matter. That link is available on the Diocese of Camden website. Take 90 seconds to watch it. The United States Conference of Catholic Bishops (USCCB) lays out five steps that can be taken to protect our children. The first is to develop healthy and loving relationships. Parents are the first and most important teachers in a child’s life. We teach them how to eat, how to dress, how to relate to others, how to learn. We teach them how to pray and to grow close to Jesus. Since a child’s primary language is play, we develop relationships by playing with them, learning how to laugh, how to enjoy life. Amongst all of that instruction, we must teach our children morals and model for them how to form healthy relationships. The second step is to teach safety. In the Diocese of Camden, every adult who works with children is trained by attending a VIRTUS® Protecting God’s Children session. Our clergy — priests and deacons — receive the same type of safe environment training. These sessions teach how to recognize child sexual abuse and internet dangers. Most important the sessions present a five-step plan on how we can all work together to prevent child sexual abuse. In our schools, the children also learn CAP and learn what it means to be safe, strong and free. Children in our religious education programs listen to Child Lures Prevention and learn the various lures a predator might use to groom and abuse children. Thirdly, know who has access to your children. Parents should know that at our schools, classroom teachers are not the only ones in contact with our students. There are coaches, special instructors, maintenance workers, food service providers, to name a few. In the parishes, in addition to catechists, there might be other volunteers involved. Every adult who has ongoing contact with children has a criminal history background check done or approved by the Diocese of Camden. Inexplicably, there are still some adults who try to avoid a background check. When they argue with me, they lose. The safety of a child is much more important to me than the adult’s ego. The fourth step is to learn the warning signs of abuse. Some of these signs may include a sudden change in behavior, becoming more sullen or withdrawn, an unexplained drop in grades at school, wearing heavier clothing such as sweaters even when the weather does not call for it, angry outbursts that may not have been there before, drastic emotional mood swings. A more comprehensive list can be found on the website pages of the Office of Child and Youth Protection. The last step is to trust your instincts. There is an axiom that “if it is too good to be true, it probably is.” We need to apply our gut instincts to the adults who want to have ongoing access with children. If we have an “ew” feeling about someone or see that an adult is saying inappropriate things to a child, we have every right to protect them. Trust your gut; it is usually right on. We live out the Gospel when we protect and keep safe the children entrusted into our care.